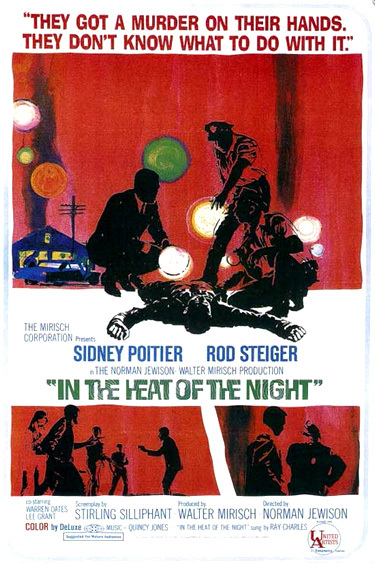 In the Heat of the Night (1967) is a tense whodunit detective story thriller that was set in the little backwater town of Sparta, Mississippi during a hot spell in September. The ground-breaking, sometimes pretentiously-shot film featured an innovative jazzy (bluesy) score by Quincy Jones, with the title tune sung by Ray Charles. Norman Jewison masterfully directed this murder melodrama from a screenplay by Stirling Silliphant that was based on the first of three mystery novels by John Ball (written in 1965) about a black detective named Virgil Tibbs. "They got a murder on their hands. They don't know what to do with it." "They're going to pin something on that smart cop from Philadelphia...Maybe a medal...Maybe a murder"
violence surrounding the Democratic National Convention in Chicago, and much more. The crime drama's story was about the forced, odd-couple, police-procedural collaboration of a bigoted but shrewd, black-booted Southern sheriff and a lone, intelligent, and taciturn black homicide expert from the big Northern city of Philadelphia. As they worked together to solve the murder mystery in an atmosphere of hatred and antagonism, the central focus of the film was on the changing, unfolding relationship between the two clashing, strong-willed men as they moved from inherent prejudice to grudging mutual respect and admiration for each other. It was remarkable that a non-white actor, Poitier, was playing a lead acting role in a fish-out-of-water tale as a professional homicide expert. He became the first black man to play the role of a smart and highly-educated detective, and even more importantly, the first to strike a white man in an American film. The filming was so controversial and threatening that it couldn't be shot in the Deep South, so the sets were recreated in various small towns in two states: Illinois (Sparta, Freeburg, and Belleville) and Tennessee (in the cotton-growing community of Dyersburg, for the plantation and greenhouse scenes). The script meandered around at times with non-essential plot diversions and red herrings, the time frame of some of the events didn't match up, and it appeared that the main characters never slept. There were at least four suspects in the case over a two-day period, each eliminated one by one by evidence uncovered by the black detective: first Tibbs himself, then petty criminal Harvey Oberst, racist cotton plantation owner Eric Endicott, deputy Officer Sam Wood, and finally the real killer -- diner worker Ralph Henshaw. It ended almost anti-climactically with a quick and slightly unsatisfactory and confusing solution to the murder, capped by a taped confession. It was a surprise that the nominated director Norman Jewison failed to take home the Best Director Oscar for the celebrated, seminal late 1960s film - instead Mike Nichols won the award (presumably because he had failed to win as Best Director the previous year for Who's Afraid of Virginia Woolf? (1966)). The film's other losing nomination was for Best Sound Effects (James A. Richard). Following the success of this film, Sidney Poitier reprised his Virgil Tibbs character in two other 'sequel' films: he investigated the murder of a prostitute in the sequel They Call Me Mister Tibbs! (1970) and battled against a drug smuggling ring in The Organization (1971). The film was the first Best Picture Oscar winner to be adapted into a regular prime-time TV series (NBC: 1988-1992 and CBS: 1992-1995), with Carroll O'Connor as Sheriff Bill Gillespie and Howard Rollins as Virgil Tibbs. In the heat of the night, seems like a cold sweat creepin' cross my brow, yeah. In the heat of the night, I'm feelin' motherless somehow. Stars with evil eyes stare from the skies. Ain't a woman here before knows how to make the mornin' come. It's so hard to keep control, well, I could sell my soul for just a little light. In the heat of the night, I've got trouble wall to wall Oh yes I have. I repeat, I repeat in the night must be an endin' to us all. Oh Lord, it won't be long, just you be strong, and it'll be all right in the heat of the night. In a dark alleyway at about 3:00 am, Officer Wood abruptly brought his car to a halt - after spotting a sprawled figure face down on the pavement. After touching the body, blood on his fingers identified the crime was a beating, robbery, and murder, and he rushed back to his car to report the incident. The next sequence began at the scene of the crime with flashbulbs popping by photographer Charlie Hawthorne (Eldon Quick), with close-up views of the homicide victim's face from many angles. He was identified as wealthy, prominent and powerful Northern (Chicago) industrialist Philip Colbert (uncredited Jack Teter) with his skull caved in. Stodgy and overweight, gum-chewing, fast-talking, redneck Sheriff Bill Gillespie (Rod Steiger) supervised the investigation. Dr. Stuart (Fred Stewart) noted that Colbert would have brought progressive modernity to the backward, economically-struggling, bypassed burg: "He came all this way to build us a factory, make something out of this town. Look what it got him." There was no wallet or ID on the body, however, and no witnesses to the recently-committed crime. The Sheriff speculated that the killer might be a passing hitchhiker and ordered Officer Wood to check out the train depot and the pool hall. At the deserted and dark train station, the officer entered and spotted an individual seated on one of the benches (off-screen), and called out: "On your feet, boy! I mean now!" - apprehended only because of his skin color. The well-dressed gentleman (he had removed his outer coat, but was wearing a tie), who was quietly minding his own business, was black stranger Virgil Tibbs (Sidney Poitier) who was awaiting a late night train to Memphis. He was shocked to be ordered to rise at gun-point and brusquely treated like a lowly criminal ("Up against that wall. Get them hands high! Spread them fingers! I want to count all 10. Now, you move before I tell you to, boy, by God, I'm gonna clean the plow"), but was calm, obeyed and remained compliant. After a pat-down, the officer removed the man's wallet - surprised it was so fat and filled with bills! ("That pretty fat there, ain't it, boy?"). [Note: A black man normally wouldn't be so wealthy, unless he had possibly robbed a white man - the officer's unspoken suspicions.] The suspect, continually and derogatorily called "boy," was ordered into the back of the police car and driven to the police department. He had been arrested as a prime suspect solely because of his color, without any questions asked. Sheriff: Got a name, boy? Sheriff: Virgil. (He smiled and laughed) Well, I don't think we're gonna have any trouble, are we, Virgil? Now look. I try to run a nice, clean, safe town here. A town where a man can sneeze and not get his brains beat out. You follow me?...Why don't you tell me how you killed Mr. Colbert, and I promise you, you're gonna feel a whole lot better. When photographer Charlie delivered the 4x5 photos of the dead man, and requested reimbursement, Virgil also asked to see them: "May l see the man l'm supposed to have killed?" Virgil spoke to his Chief of police boss in Philadelphia and apologized for bothering him: "I really had no choice." He rejected his insistent boss' idea to assist in the local investigation ("They wouldn't want it...No, sir, I'm not prejudiced"). When Gillespie was handed the phone, he was told that Virgil was their "number one homicide expert" and that his decision was final, but Gillespie was confident in his own police force: "I think we can wrap this thing up ourselves." He referred to the ultra-competent Tibbs as "a powerful piece of manpower." After the call, the Sheriff suggested - almost challenged - that Virgil might want to look at the photos of the dead man, but Virgil angrily stormed out (due to his discriminatory treatment), claiming he had a train to catch (but now he would have to wait many hours until the mid-day train). Gillepsie was forced to admit he wasn't an "expert" like Virgil was. The mistreated black officer seemed to be fighting an internal war with himself - should he stay and help the prejudiced white Sheriff or not? In Ulam's Funeral Parlor at 4:45 am, the victim's body was laid out on a table and covered by a sheet in the makeshift morgue. Dr. Stuart commented: "Ten cents, ten million dollars - just doesn't matter when a man's time comes." In his bathrobe after being awakened in the middle of the night, Ted Ulam (Arthur Malet), the funeral director, responded: "I could give him a nicer service right here in Sparta than he could ever get up there in Chicago - and at half the price, too." The Sheriff and Tibbs arrived to examine the corpse. The inexperienced Sheriff gave the body a cursory look, but Tibbs - when called upon, began to perform a very thorough and complete clinical examination to find clues and signs, beginning with the touching of the victim's palms and feet. The unimpressed onlookers in the room, all racist whites (including the useless doctor), were obviously affronted when witnessing the unresponsive victim's invasion of privacy by a black man's contact. Ammonium hydrosulfide, benzidine, some peroxide of hydrogen, copper powder, distilled water, a six-inch celluloid scale, thermometer, some tweezers, callipers, and some toothpicks. Since the body was found at 3:00 am, Dr. Stuart surmised that the murder occurred possibly at 2:15 or 2:30 am. But when Tibbs mentioned that rigor mortis (with "post-mortem lividity") had already occurred, the time of death had to be much earlier. [Note: Post-mortem lividity, or hypostasis, occurs when blood in the body settles due to gravity, usually approximately within 30 minutes to 2 hours after death.] Tibbs also knew that a thermometer would easily determine the "loss of heat from the brain" - one of the best indicators of the amount of time elapsed since death. A phone call interrupted the uncomfortable proceedings marred by Southern racist tensions - the Sheriff was notified of a "runaway suspect" who was in flight, and he hurriedly excused himself to join in the chase. Bloodhounds barked in excitement as they pursued a fugitive suspect (seen in some jerky POV shots), later identified as petty criminal Harvey Oberst (Scott Wilson), who fled through a sun-dappled forest of autumn-colored trees (an impossibility in September! ), presumably in the bright sun of late morning. One of the deputy officers, Shagbag Martin (Timothy Scott) radioed on a portable walkie-talkie that the suspect was attempting to cross the Mississippi River from the state of Mississippi into Arkansas, to escape local jurisdiction. Harvey ran down an embankment and along the water's edge next to rows of railroad tracks. He scrambled over dirt and rocks, and then climbed up a maintenance ladder that led to the bridge crossing. Sheriff Gillespie pursued Harvey in his squad car and caught up to him about halfway across the immense bridge - the capture was viewed from an extreme distance.